President Donald Trump said that he was looking for a “phase two” of tax cuts. 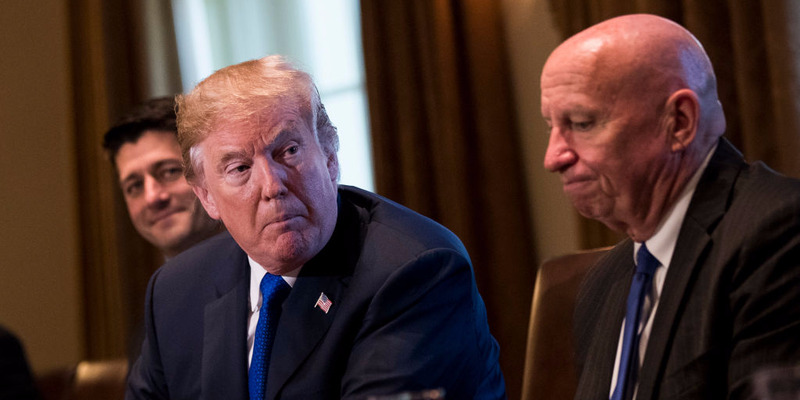 President Donald Trump on Monday appeared to suggest that there could be another tax cut bill on the way. During the Houston Astros visit to the White House to celebrate their World Series win, Trump called out Rep. Kevin Brady, who represents a district just north of Houston. Brady helped author the recently implemented Republican tax law. “Kevin are we going for an additional tax cut, I understand? He’s the king of those tax cuts. Are we going to do a phase two? I’m hearing that,” Trump said. “Phase two, we’re actually very serious about that Kevin. But Kevin Brady is a spectacular person and did an incredible job with the tax cuts,” the president continued. It’s unclear exactly what Trump was referring to, as there is currently no major push among GOP leadership for a second tax cut bill. There have been rumblings about the need for a technical corrections bill that would clean up the myriad glitches in the original law. Brady and other Republicans were open about the need for such a bill almost immediately after Trump signed the original law. Technical corrections bills are fairly typical for large pieces of legislation as tweaks are needed to administer the law properly. Despite needed to make changes, passing a technical corrections bill for the tax law may be tricky for Republicans since they blocked Democrats’ attempted fixes to Obamacare. In addition to the tax hint, Trump also highlighted Friday’s jobs report during the event. The US economy added 313,000 jobs in February, according to the report, much higher than what economists expected.